What is this Google Chrome Frame (GCF) ? How can i Render my Blogger Blog using the Chrome Frame? 2. Go to Design > Edit HTML tab. 3. Look for <head> and immediately below it paste the following line of code. 2. Normal rendering (if GCF is not installed) – No the user won’t be prompted to install the Chrome Frame(unless you add some extra scripts to do that). How can i prompt the visitor to install the Chrome Frame? If you want, you can prompt IE users( who have not installed GCF) to install GCF. This is optional . To prompt users, Follow these steps. 4. Save the Template. 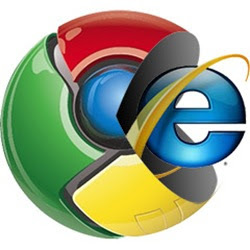 Now the IE user will be prompted to install the Chrome Frame(if he hasn’t got it already). This prompt will appear only once(stored in cookie). Thanks for the tip. All the best. And many problems were in my template found in IE were Fixed! Thank you for this one. My blog is having a problem with IEs and I hope this can fix the problem. Thanks! Awesome post! Thank you so much for sharing. This entire Blog is fantastic! Thanks for the great post, i continue to learn from your advice! for promoting the users i think above code can be much simplified by using the code below. I was looking for a way to render my site using chrome thanks. very clear instructions! thanks for the tips!